Aboud Zazi was born in Beirut–Lebanon on May 20th, 1966 and lived there until 1976 when left with his family to Sweden. Aboud Zazi lives in Södertälje. He liked music since his early childhood from home. In 1981 he played his first song on the stage of the Assyrian Cultural Club in Södertälje in a cultural evening. This event was his start and followed by several progresses until these days. He released his first cassette “Gelyono” in 1991. Gelyono was a combination of eight songs among them “Nadro Dhoubo” lyrics by Georges Chamoun, and music by Hikmat Chabo. “Izla Shafirto” too was one of the best songs written by Georges Chamoun and composed by Aboud Zazi. In January 2000 Aboud Zazi released his first CD “Bartho Tourayto” which consisted of ten songs. This CD included many beautiful songs like “Waado do Qtoro” and "Latyo Aybo Wlo Htitho". The album is a collection of Touma Nouhroyo, Georges Chamoun, Elias Younan and others writers. Hikmat Chabo, Elias Zazi, Gabriel Masso and Tomas Rhawi who gave the music to this CD. 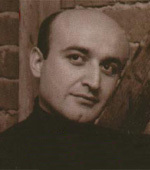 Aboud Zazi´s songs are very popular among the young generation. His songs are of great interrest for the young generation, they sings in every party or occasion.